Manufacturing as we know it has developed over the centuries into the behemoth industry that it is today. The 18th century and industrial revolution opened the door to mass produced goods that benefited from economies of scale and led to advancements in society that welcomed a new era of civilisation. Industry and manufacturing has developed further over the course of three centuries, from industry 1.0 and the use of steam power, to 2.0 via electrification and assembly lines, 3.0 with the use of information computing technology and we are now transitioning to industry 4.0 smart manufacturing via digitization and the application of cyber physical things. One of the technologies said to be facilitating this change is blockchain, but what effect will its application have on the manufacturing industry? Blockchain is based on distributed ledger technology, which does away with centralised systems. Moreover, the idea behind the ledger is that it becomes tamper-proof when the data entered on it is stored in a system of chronologically ordered blocks which are linked via a complex mathematical puzzle (cryptographic hash) to form a chain. Hence, blockchain. The technology rose to fame with its application in Bitcoin, a cryptocurrency used as a medium of value exchange, yet it can be applied across many industries to disintermediate and therefore bring about greater transactional efficiency. Cost reduction, improvements in tracing product provenance, and transparency are the main driving force behind blockchain adoption. One industry that is set to greatly benefit from the application of blockchain is the manufacturing industry. Blockchain + Manufacturing = ? It would not be an understatement to say that, although blockchain has thus far only found real-world application in finance and cryptocurrency, it’s greatest potential to deliver value to business as a whole is in manufacturing. Transparency and full product provenance here are key, since blockchain is able to create completely new business models by recording every aspect of manufacturing, from the raw materials, to the processing and sourcing of these inputs, to the supply and distribution of manufactured goods and recording of their point of sale. In today’s globalised world, the consumer is much more interested in where their products originated from, whether they were produced in an eco-friendly way, etc. In essence, blockchain has massive value in supply chains, and supply chains are the cornerstone of every manufacturing business. As such, increasing supply chain efficiency via the implementation of this technology will mean manufacturers can improve their material ordering process, product quality, resulting in better sales. Some of the biggest names in manufacturing have already begun piloting blockchain-based solutions, with billion-dollar firms such as Moog Aircraft Group piloting a solution for parts built with additive manufacturing. Additive manufacturing: creating a physical object from a 3D digital design (e.g. 3D printing) for parts which are more durable, lighter and stronger. Blockchain is used since manufacturing as a service (MaaS) is less a hardware production challenge than a records-management one. As such, this facilitates a need for new business models for how, when, and where products are manufactured. Businesses need to decide which network of supply chain assets and which mix of old and new processes will be optimal. High-value, high-risk manufacturing segments such as aerospace will likely make the shift sooner than later, bringing pilot schemes to reality. Moreover, the solution can be expanded to open ecosystems of supplier-consortiums. Let’s take a look at how this would work in practice. A UK business receives an order for 3D parts from a Chinese client. Due to location-specific advantages a parts producer in China wins the contract to supply the part. The business is part of a consortium blockchain platform from which its design for additive manufacturing (DfAM) is downloaded. The consortium’s blockchain platform represents neutrality, which creates trust and transparency that encourages supplier participation. For every individual download of the design, the rights owner of the intellectual property (the design) holder receives a royalty. The IP rights’ owner is part of a supplier consortium which not only provides intellectual property protection, but also insurance and instantaneous recognition of revenues. During the manufacturing of the parts, the identity of the operator and the machine is recorded to the blockchain, in addition to the fingerprint of the part’s grain structure during the manufacturing process. The full lifecycle of the part, provenance, authentication, traceability, and secure data transport (data packages) is visible throughout the supply chain and can be verified by a QR code which comes on the part. On the basis of the above steps, an on-demand parts network is formed. By combining the benefits that blockchain brings with other technologies such as the Internet of Things (IoT), machine learning and others, we end up with a complete data set about manufactured items. The value in this is massive, not only from a production point of view to understand where there are pain points and inefficiencies, but also on the consumer side, whereby consumers are all the more interested in learning about the product origins of the items they purchase. So why isn’t blockchain underpinning the manufacturing industry right now? 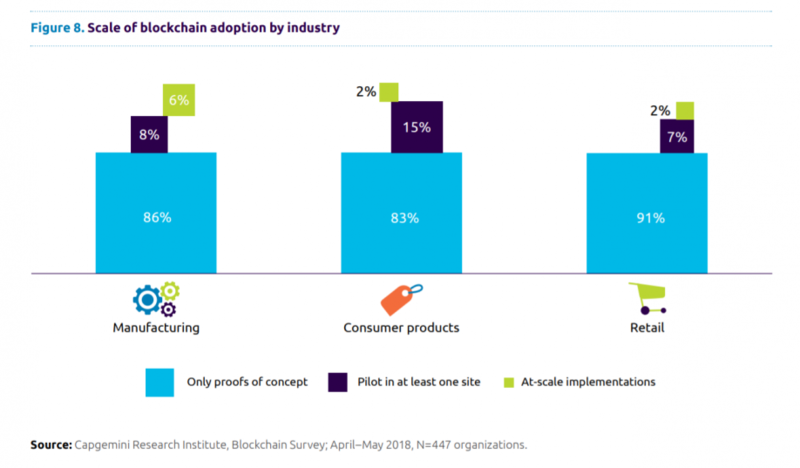 Whilst research from Capgemini shows that manufacturers have the most at-scale implementation of blockchain at present (see above), the technology is still considered as immature. Right now, the high cost of blockchain implementation does not demonstrate a clear return on investment and, with blockchain being a nascent technology, many businesses are reluctant to integrate yet unproven and widely-accepted technology. The technology’s nascency is demonstrated by the small (6%) percentage of at-scale integration as shown in the Capgemini research. However, according to the World Bank, manufacturing accounts for almost 17% of worldwide GDP, making it a key driver of the global economy. Meanwhile the cost of blockchain implementation pales before the market value for counterfeit goods and piracy, which is valued at over $1 trillion and forecasted to reach almost $3 trillion by 2022. It becomes clear that, in addition to the creation of new business models and improvement of existing processes, blockchain’s usage in manufacturing has value in controlling and documenting events, with resulting increases in transparency. This would reduce the “trust tax” that is currently levied due to issues between transactions between many parties. Whilst blockchain is not implementable across all sectors of society, in industries such as manufacturing where there are multiple parties that rely on the veracity of the data they share and access, a decentralized and collaborative network is worth implementing. 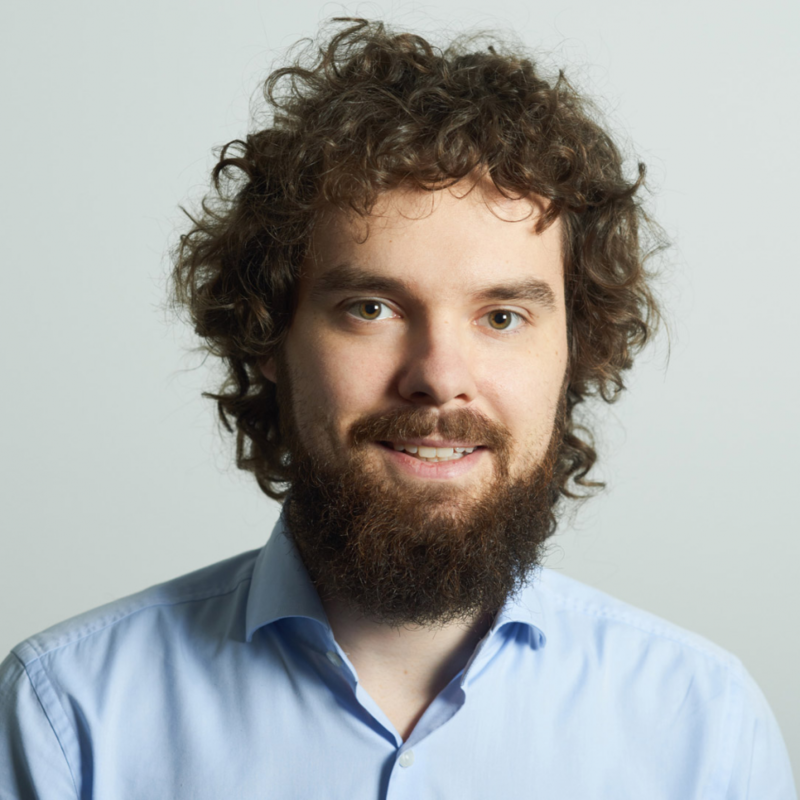 Peter Fedchenkov is the co-founder of Insolar. Insolar is an open-source enterprise-grade blockchain platform to enable seamless interactions between companies and new growth opportunities powered by distributed trust.